Tomorrow, December 15th, is National Cupcake Day!!! That has to be the best food holiday ever! This is the one time I wished I lived in a major city, so I could visit all the amazing cupcake stores in one day! Instead, I will celebrate with myself and force my boyfriend to eat cupcakes with me; it shouldn’t be too hard. I am celebrating National Cupcake Day with Hot Chocolate Peppermint Mousse filled cupcakes with White Chocolate Swiss Meringue Buttercream. I am bursting at the seams to make dozens and dozens of holiday cupcakes: so many flavors, so many combinations. Last weekend, I was playing around with flavored whipped creams, so I decided to create a cupcake based around chocolate and peppermint. I started with my go-to quick and easy chocolate cupcake. I love homemade cupcakes, but sometimes it’s just easier to grab a box, add a few ingredients and boom, you’re done. 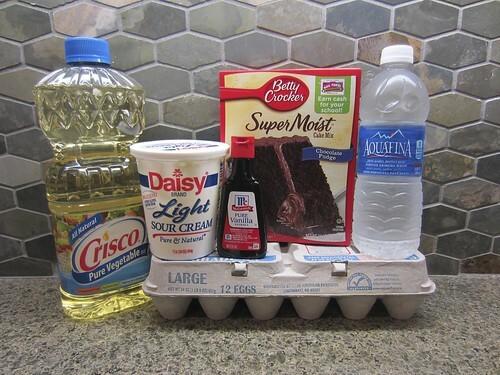 The recipe for my favorite chocolate cupcake comes from The Cake Mix Doctor. I actually have both of Anne’s books, and I love them; this one comes from her second book. Divide batter among lined cupcake pans filling 1/2-2/3 full. Bake the cupcakes at 350° F for 12 minutes. Check the centers and bake for another 2-3 minutes. The tops will crust over, but will soften once cooled. Let cool for 5 minutes in the pan before transferring to a wire rack to cool. 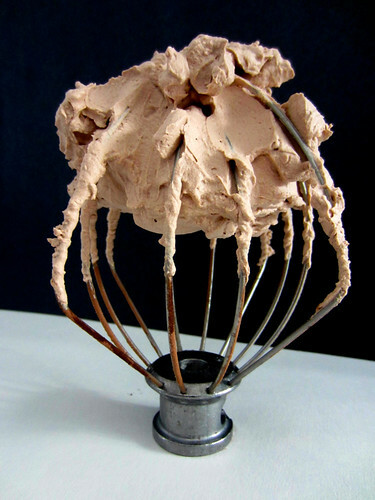 Next, I whipped up a batch of hot-chocolate peppermint whipped cream and put it in the fridge for an hour so it turns into mousse and I use it as filling for my cupcakes. I contemplated which frosting to go with for a while. I wanted the filling to be the main focus of the cupcake, so I didn’t want to go with a really sweet frosting. I decided to go with a white chocolate Swiss meringue buttercream. Swiss meringue is becoming a favorite of mine. The extra time it takes to make is so worth it. I did a quick Google search and landed on the Baker’s Royal blog. The photography on this site is the envy of my eye. For a more detailed post about how to make Swiss Meringue buttercream, please visit my original post. Remember to use all grease-proof materials. This was the first time I have added melted chocolate into a SMB, it’s important to make sure it is completely cooled before adding it in. Temper egg whites and sugar in a heat-proof bowl over a pot of water on medium heat. You need just enough water to cover the bottom of the pot. Heating the mixture to 140°F. Make sure to stir constantly to avoid cooking the egg whites. Add butter 1 tbsp at a time, ensuring each addition is well mixed. Add salt and continue to mix. Crush Andes mints inside a plastic bag, using a rolling-pin or something heavy to break pieces a part. To assemble the cupcake, put the chocolate mousse in a piping bag with a large tip; I used a Wilton 1M tip. 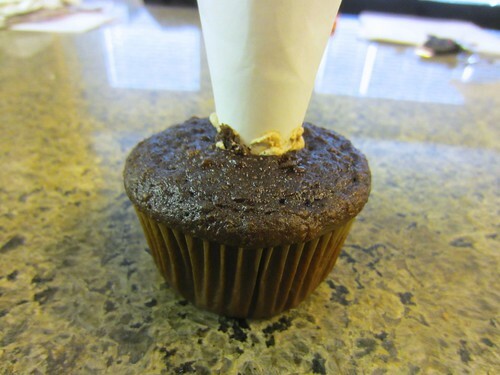 While holding the tip in place, push into the center of your cupcake, squeeze the bag and lift slowly allowing the mousse to fill the center of the cupcake. Once all of your cupcakes are filled, prepare your frosting. 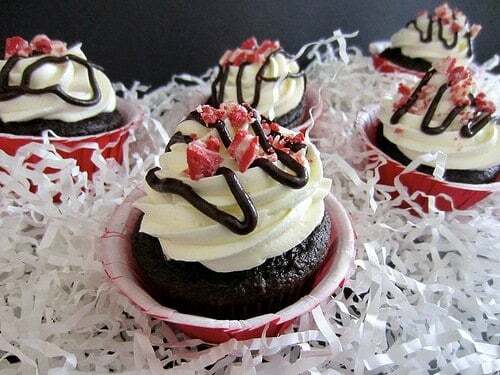 As a side note, you will want to keep your cupcakes refrigerated after you fill them, so if you are serving them the next day, put them in the refrigerator overnight and allow them to come to room temperature before serving, as your frosting will harden once refrigerated. Prepare your frosting, using a large piping bag with a large tip of your choice. Fill your bag and frost each cupcake. Piping cupcakes is one of my favorite things to do! Top with chocolate ganache and pieces of Andres peppermint chocolates. These might be my new favorite holiday flavored cupcake. 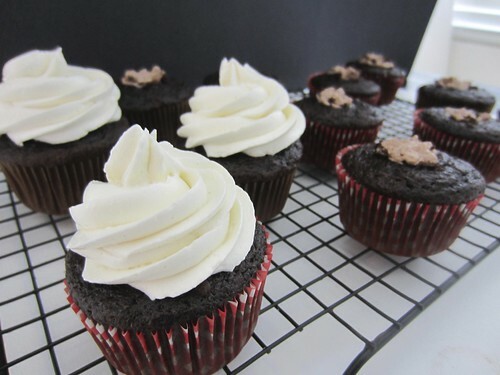 The chocolate cupcake, peppermint whipped cream and white chocolate frosting make every bite a party in your mouth! The peppermint hot chocolate whipped cream filling sounds incredible! I’m going to have to make this soon! Thank you! You definitely should try it! Thank you for checking it out! OMG these look good! Thanks for visiting my blog – which brought me to you!